At Acumen Fieldwork we’re always thinking about how we can help to make your research run as smoothly as possible. And thanks to our years of experience in providing project management and logistics support to the Qual, Quant and Healthcare research sectors, we’ve learnt a thing or two about the ideal times to conduct research on certain topics. 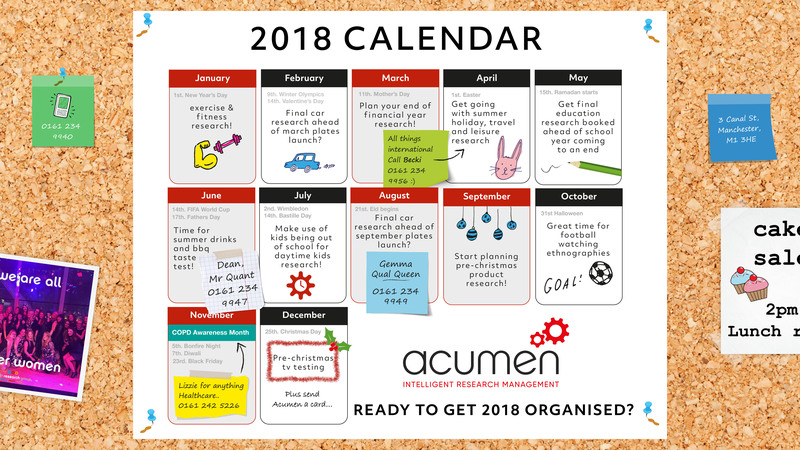 We’ve put together our 2018 research calendar so that you can easily see when the big seasonal research subjects are coming up and who you need to speak to at Acumen to get things moving. Whether it’s qualitative, quantitative, healthcare or an international project, our team are here to provide support and assistance. Feel free to share our 2018 research calendar or contact any of our team about your research needs today.